The May USATF Club Road-Racing Series moved to Orange County for a fast 5K around Corona Del Mar HS, on Saturday May18…and Club Ed racers were there! We came with almost 20 runners, ready to test the fast and well-organized race, which was overseen by Coach Bill Sumner of Cal Coast Running Club (thanks, Bill, for a great job!). When the smoke cleared, the crying stopped, the butter got hard, the jello stopped jiggling (or was that my stomach? ), we had another impressive showing…though we were somewhat overwhelmed by the numbers of Cal Coast runners (100?200?) and the speed in the race. The overall race was won by 24yr old Jordan Chipangama (Flagstaff AZ) in 14:24, while on the women’s side, Belainshe Gebre (26yrs old) tore through the course in 15:55. Our racers’ times are shown below. We had some impressive racing debuts with the team (nice to have Jeff, Kevin, Chuck, Mike, Tami, Diane, and Mark out), some welcome returns (Nathalie & Alison are back leading the way), a few PRs (Aaron and Sabina, nice work! ), some encouraging returns to racing (Jake, Sharon, Karina), our go-to guys (Humberto, Jon, Rich, Mark)and some wake-up calls for steady improvement (well, all of us could improve, can’t we?). Congratulations on a race well-run! I got dropped off by my Aunt's family at the State Park in Hopkinton at about 7:45 am on race day to take the shuttle to the starting area. Much preferable to taking the bus... I was able to wake up at around 6am as opposed to 4am to get to downtown and catch a bus. I sat around for a while, did about a mile warmup jog with some pacing in the middle, and started to make my way to the starting line at around 9:15. By the time I had dropped my bag off and prepared it was about 9:45, so I only had to spend about 15 minutes in the corral, which was nice. When the gun for the pro-men went off, it took me about 2 minutes to cross the starting line (I was in wave 1, corral 4). The first 3 miles of the race were pretty uneventful. I was worried that I was caught in the crowd and going too slowly (started at over 7 minute pace), but after a bit the crowd started to pick up and the first split was an acceptable 6:52. Coming down the hills and seeing the road packed shoulder to shoulder with runners as far as the eye could follow was pretty amazing. Such a big race! I ended up finding a dude that I raced with at LA Marathon last year and said what's up. We cruised together for a while, but he started to fade about 12 miles in (I guess he was injured for a month or so), so I didn't see him again. The rest of the first half was actually pretty uneventful as well. I was worrying a little about my legs because they felt so heavy, but I resolved to run by feel and not break myself to early. I wanted to hit a 1:28 first half but ended up at 1:30:05. Running through Wellesley was pretty insane, I could barely hear because of all the yelling from the girls, but it was the first of many sections that were amazing from all the crowd support. Miles 13-15 were a little rough and I'm not sure why. Perhaps my nutrition was a little lacking through there, but I'm not sure. Mile 16 is where the Newton Hills start. I had some family at the Washington Street overpass who handed me some liquid calories (Gu Rocktane Endurance Drink) which I drank over the next 4 miles. The hills themselves were not too bad. I slowed my pace for fear of blowing up (hill chops were as-yet untested), but I ended up running 7:18, 7:21, 7:05, 7:19, 7:29 through the hills and up Heartbreak Hill. At the top of Heartbreak Hill, I checked the clock and I realized that I would have to run ~6:20/mile pace to break 3 hours, which was not happening. This was a little disappointing, but also relieving, because I knew I could still hold out for sub 3:05 (re-qualifying time). The other thing that felt great was that my legs felt decently strong and I was able to hold 6:49 averages from there until the mile 25 marker. At mile 25, I could feel the wheels starting to come off, but I knew that 1.2 miles to go was nothing I hadn't hammered through before, so I hammered it out averaging about 7:15/mile for the remainder, crossing at 3:03:47. My overall impression of the race was incredible. The crowd support was insane. Better than any race I've ever done, because they are pretty much non-stop for 26 miles. The race was impeccably run, and the value was high (great expo, a pre-race dinner, and a post-race party (cancelled), all included in the race fee). The chance to run on such a storied course was also an amazing experience, and I felt lucky every step of the way. The comraderie at the finish line was completely unexpected. At a race where there are more than a handful of serious runners finishing at 3:00-ish, it's awesome to talk it out with everyone who had been feeding off of each other in the final miles. I ended up being nowhere near the bombings, as I had finished and was on the subway when it all happened, so I was pretty much unaffected. I think we can all agree that what happened was terrible, so I'll limit my comments to running-related topics. 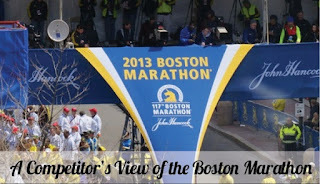 My post-race was completely thrown off by the events that occurred. Normally I process my race over and over again to figure out what to work on for next race, but I'm just now beginning to think about what to work on over the summer. I hope the other runners who did not get the stellar race experience that I got will get another chance to run the Boston Marathon and receive an official time/finishing experience. A Note From A Runner Who Recently Joined . 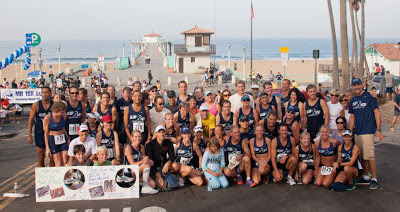 . .
Having lived in the South Bay since 2005 and an avid runner, I naturally heard about Club Ed in my small running circle. I had always thought about joining, but assumed I needed to be a bit more serious about my running and be able to devote more time to the club. This past February 2013 I decided to 'bite the bullet' and join. It is the best decision I have made in a while!!! I run track on Wednesdays and the long mileage hill runs on Saturday mornings. In the past 3 months, I have seen increasing progress in my tempo runs and my races. I consider myself more of a long distance runner, but Ed encouraged me to run a 5K for speed. So, for the first time since high school, I signed up for a 5K in April and had a great time, surprising myself with my time.